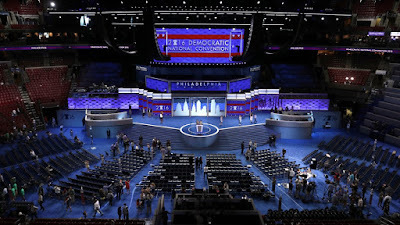 THE FLAG OF HATRED FLIES AT THE DNC: There was not a single AMERICAN FLAG anywhere to be seen at last night's DNC opening. In fact, the only flag to be seen in either the audience or on the stage was the flag of the Jew-hating, mythical 'Palestinians' calling for an end to Israel. Now you know the difference between the RNC and the DNC conventions. CROOKED HILLARY HAS SAID OVER AND OVER THAT THERE IS A ‘STARK CONTRAST’ BETWEEN THE REPUBLICAN AND DEMOCRATIC CONVENTIONS, AND BOY WAS SHE RIGHT ABOUT THAT.